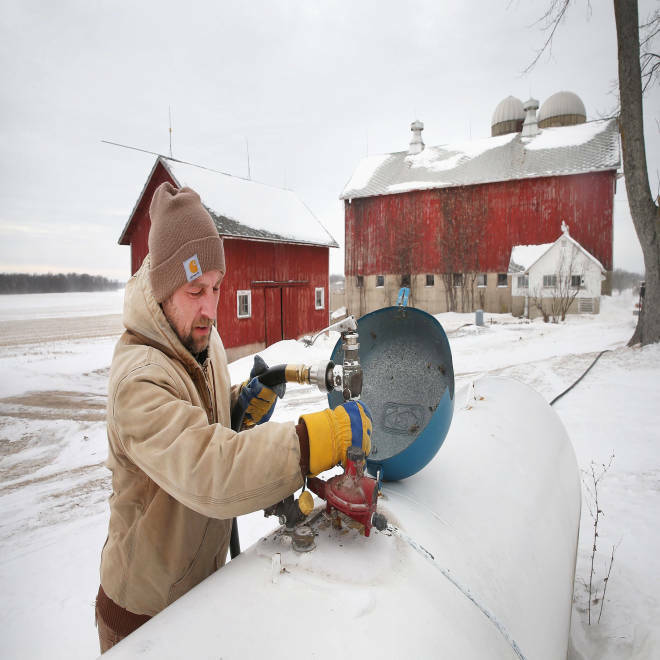 Mark Burger of Blackhawk Propane delivers propane to a farm house on Jan. 24, 2014 near Clinton, Wis. A shortage of propane in the Midwest has caused prices to surge upwards to near $5 a gallon in some markets. America’s chronic cold is creating a significant propane shortage across the Midwest — leading Wisconsin to become the latest state to declare an energy emergency in advance of more arctic air blasting eastward this week. Freezing temperatures, snowfall and delayed flights are just some of what an arctic air mass has brought the country. Some 14 million Americans who rely on that type of fuel have been shelling out more and more to heat their homes while the strong demand has outpaced the already-low inventories, energy officials say. Twenty-four states, including Ohio, Illinois and Alabama, have already declared energy emergencies — which helps to loosen transportation rules so that out-of-state truckers can drive longer hours to make needed propane deliveries. Snow fell Sunday in parts of the upper Midwest, including Wisconsin, where the sub-zero overnight temperature is expected to hang around Monday and Tuesday, The Weather Channel reported. 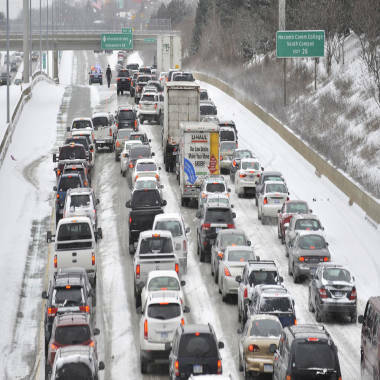 The westbound Interstate 696 is closed at Groesbeck Highway due to numerous accidents, on Sunday, Jan. 26, in Roseville, Mich.
More than 275 flights were canceled in Chicago alone on Sunday morning, according to FlightAware.com. The city also plans to close public schools Monday in anticipation of below zero and a minus-25 degree windchill. The lingering cold snap prompted Wisconsin Gov. Scott Walker to put all state agencies on emergency alert late Saturday. “The health and safety of our citizens is our No. 1 priority, and this declaration gives us the necessary resources to protect the residents of Wisconsin,” Walker said in a statement. His office said the short supply of propane was caused by record-breaking cold temperatures as well as production loss when a major pipeline supplying the fuel to parts of the Midwest was temporarily closed for maintenance last fall. About 250,000 Wisconsinites rely on propane as a source for heat. A spokesman for Pennsylvania-based AmeriGas, the largest U.S. propane retailer, said last week it was rationing deliveries to “small pockets” of Alabama, Georgia and Tennessee, reducing supplies to 100 gallons per customer from the standard delivery of some 250 gallons. All the while, federal policymakers representing the Midwest have heard complaints from constituents angry about high fuel prices. On Friday, propane heading for the Midwest changed hands at $4.30 a gallon — more than double its price a week earlier — although it had traded even higher at close to $5 a gallon on Thursday. Meanwhile, natural gas users in parts of the Midwest are feeling a similar strain after a natural gas pipeline south of Winnipeg, Canada, exploded early Saturday, reported NBC affiliate WEAU in Eau Claire, Wis.
Utilities, including Xcel Energy and Minnesota Energy Resources, are asking more than 100,000 customers to turn down their thermostats or use alternate heating fuels as a precaution to overloading the system. Xcel, which has customers in Minnesota, Wisconsin and North Dakota, said in a statement that natural gas supplies “currently are adequate.” But officials couldn’t immediately say when service would return to normal. No one was hurt in the pipeline blast, and Canadian officials said they were still determining the cause. TransCanada Corp., which operates the pipeline that exploded, didn’t immediately return a request for comment Sunday. The request for customers to watch their natural gas usage comes as more dangerous cold is hitting the Plains, Midwest and Northeast, and is expected to stick around through the end of the month. Forecasters warn that sub-zero temperatures will be fixtures in cities such as Chicago and Milwaukee for the next couple of days, while the Northeast, including Philadelphia and Boston, will struggle to stay above the teens and 20s. Central Michigan mom Julie Palmer was happy to take her kids to an outdoor Winter Wonderland festival outside Lansing this weekend. But she told NBC affiliate WILX that she is no fan of this winter. Frigid temperatures continue to grapple most of the country.